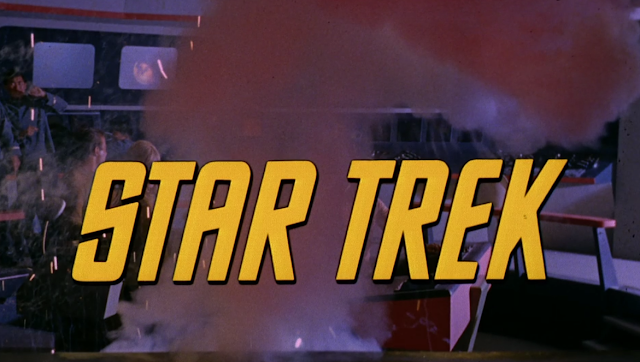 On September 8, 1966, Star Trek aired for the first time on NBC. 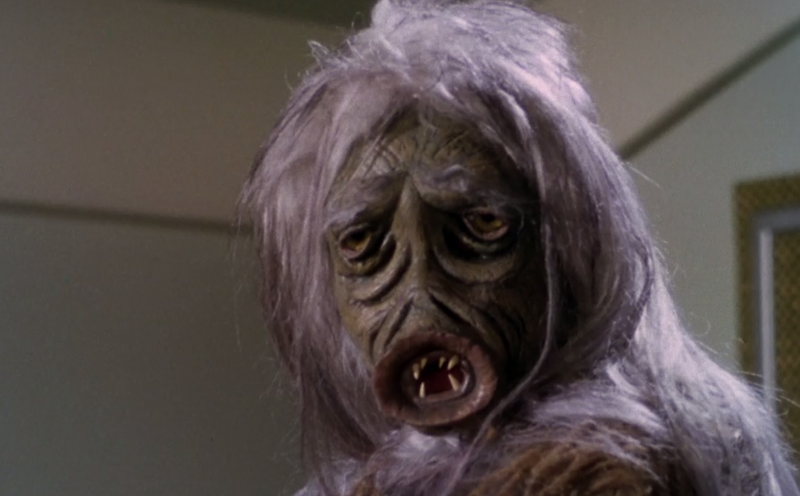 The episode that aired, however, wasn't one of the two pilots created for the show or the first episode chronologically for the Enterprise crew. Still, it's memorable as the first glimpse of one of the most influential science-fiction franchises. 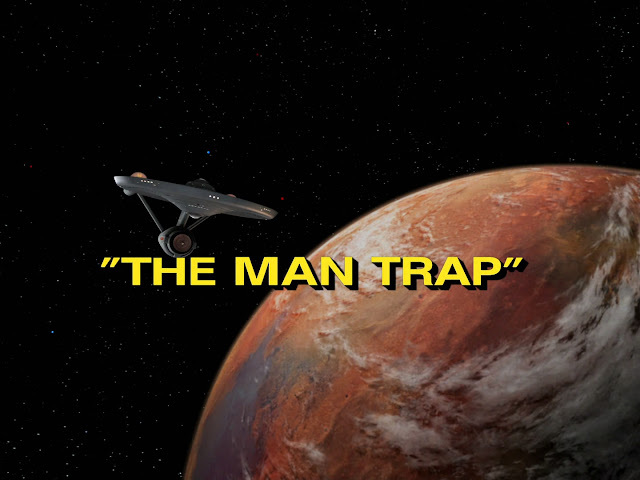 As part of The Fangirl Initiative's "Star Trek Week" celebrating the 50th Anniversary of such a phenomenal show, I am sharing my commentary on the first episode of Star Trek that ever aired: "The Man Trap." 2. I have seen most of The Original Series, random episodes of the other shows, and most of the movies. If I make reference to something without using its proper name, I'm probably doing it on purpose. No worries. The funniest thing about all the synopses I read online for this episode are they give a lot of the plot away. I don't know if it's because the show is so old they figure anybody reading the synopsis already knows the plot or if they really don't realize they are spoiling it. Also, the synopsis says "Scotty faces a decision." But... Scotty isn't even in this episode. ???? Come on, Netflix, get your act together! 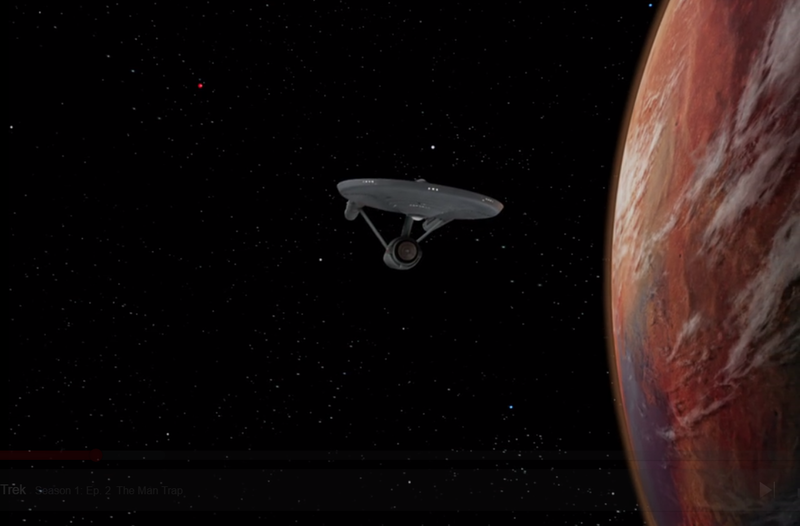 A man gives a voice-over as a model ship flies in front of a screen showing a dusty-looking planet. He talks about stardates, planets with numbers for names, and Spock being temporary captain. That's it. I just love that the opening tells you nothing. They don't explain what the Enterprise is or what its mission is. They don't explain who is talking. They don't even tell you who Spock is or why he is the temporary captain. How did anybody watching this know what the frick-frack paddy-whack was going on? What a way to start off a new TV show, NBC. Amazing. "Ship's surgeon McCoy and myself beaming down." And that other guy with the blue shirt. What's his name? Why isn't he included in the list of people beaming down. BEAMING though. Amazing. Not transporting or fizzling or magical fairy-dusting. Beaming. It's iconic. 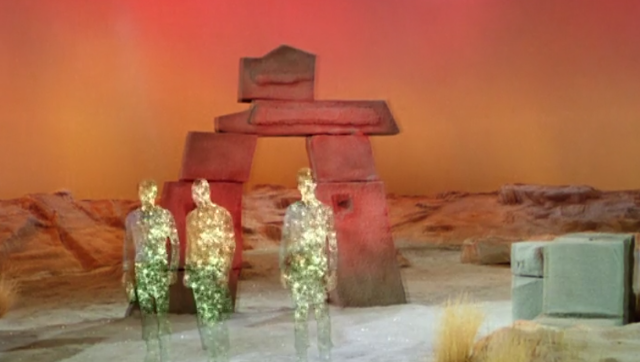 Also that background is fantastic for the 1960s. 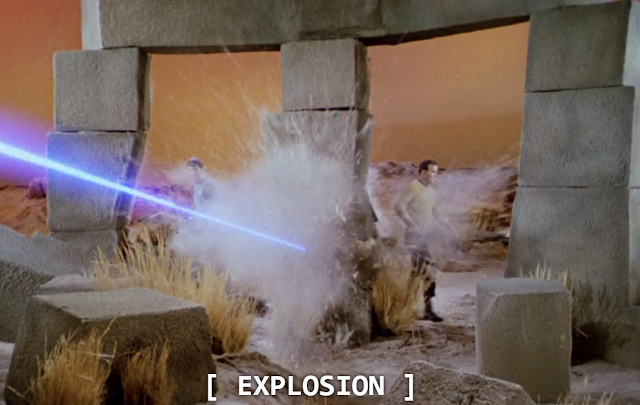 I'm very impressed by all the special effects this episode has to offer. It's so creative for such a budget. I love the Styrofoam stones and tufts of grass sticking up from them. authentic. Kirk: "Nancy Crater is that one woman in Dr. McCoy's past." 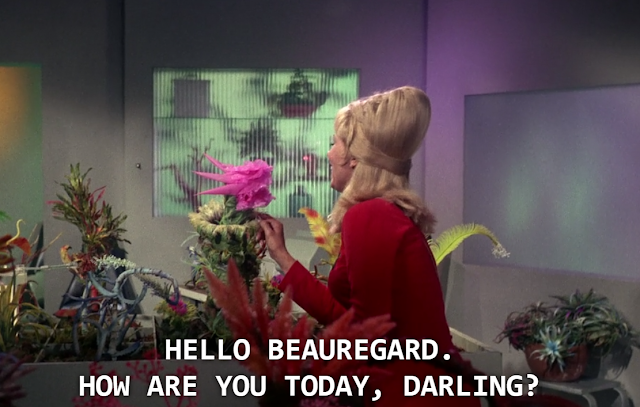 Kirk picking grass "flowers" for McCoy to give Nancy is so romantic. 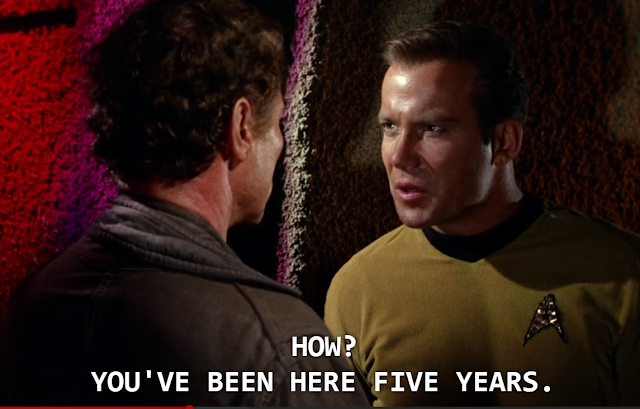 Also this is basically Kirk and McCoy's relationship summed up. 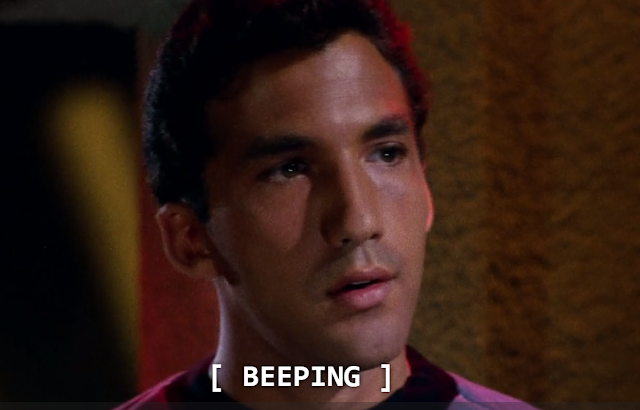 Also I'm not supposed to know he's Kirk yet because they haven't said his name yet and it's been like five minutes. Okay, but Professor Crater is an archaeologist, right? That's funny, right? Professor Crater digs up old civilizations and whatnot. And then there's the other guy. The nameless, third wheel, blue shirt guy. This guy looks like that one dude from that one movie. Also what's his name? Why are they ignoring that he exists? Just because he's not a regular character and probably won't live much longer? Rude. *Random singing* A wild woman appears! There's definitely going to be trouble. Bones: "You haven't aged a day!" "This is Captain Jim Kirk of the Enterprise." FINALLY. WE FINALLY get a name for the main character of the TV show. Amazing. Nancy slightly changes her appearance. This just in, she now has gray hair and wrinkles! Ah, now we get a name for Blue Shirt: Crewman Darnell. Perfect. Now Nancy is blonde and has a completely different face when Darnell looks at her. SORCERY. Something is definitely up with McCoy's girl. "Wrigley's Pleasure Planet" That sounds so appealing. Not. Nancy calls McCoy "Plum." All I can think of is Professor Plum from Clue. I don't understand. "She gave me that nickname when we were very young." Yeah, ten years ago. Sooooo young. I love that Nancy--or whoever she is--can seduce Darnell without doing anything but smiling and batting her eyelashes. Like she's wearing modest clothes--leggings and dress--yet he's still practically drooling over her. "Man Trap." Nice. Professor Crater arrives and immediately turns into the crotchety old man yelling, "Get off my planet!" No wonder Nancy seduced Blue Shirt Darnell. McCoy immediately turns crotchety back though. I love watching him get angry. Especially while Kirk just stands there glistening in the soft glow of the production set lights with that sly grin. Ha! 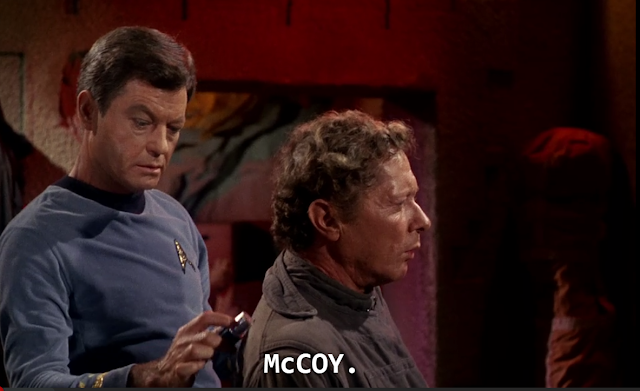 Kirk calling McCoy "Plum" just to mess with him is what I live for. What are these magical doctor tools McCoy is using? If I had known they get to use such cool things, I would have signed up for the medical division of Starfleet! Mr. Crotchety is okay that his wife is visiting with an old lover. Sounds suspicious. 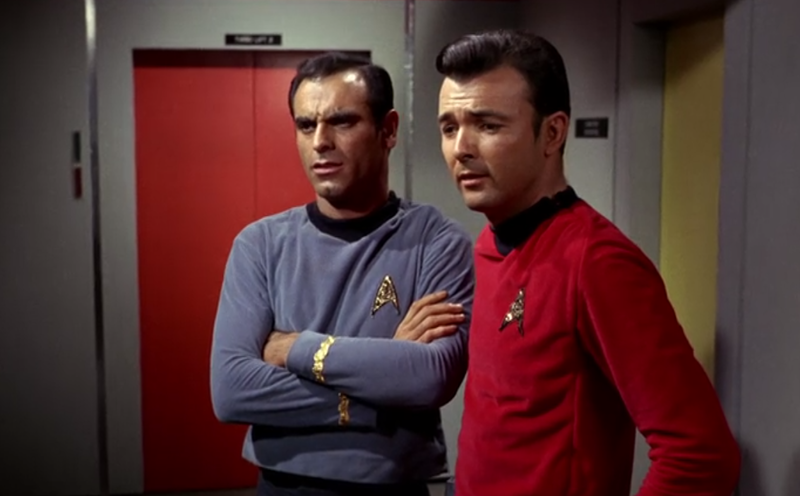 Kirk is just so smug listening to McCoy get flustered by his old flame. And everybody thinks McCoy is blinded by love, but nobody is asking Darnell what he saw. Where did that Blue Shirt go anyway? 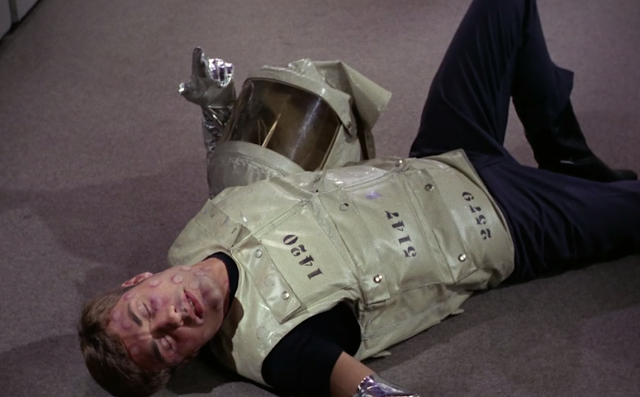 It's heartwarming to watch Kirk pull out his ultra-cool space gun and heroically dash out the door to see what is wrong. That scream is so fake though. DARNELL. Nooooo, he's lying on the ground with weird red splotches on his face. Why is Kirk sweaty? Nobody else is sweaty. Mr. Crotchety gets more crotchety. Does anybody actually believe her story? She's so faking it. LOOK! Kirk has a fancy flip phone that goes "tweet" when he opens it. Nancy: "dID YOU ASK ABOUT thE SALT TABLETS??!?!?" Salt? Oddly...suspiciously...specific. And she has such a defensive tone about the salt. Like DEAR GOD SALT TABLETS. I'm watching you, Nancy. Always watching. Okay, but how does the Enterprise not get sucked into the planet's gravitational pull? It's so close. 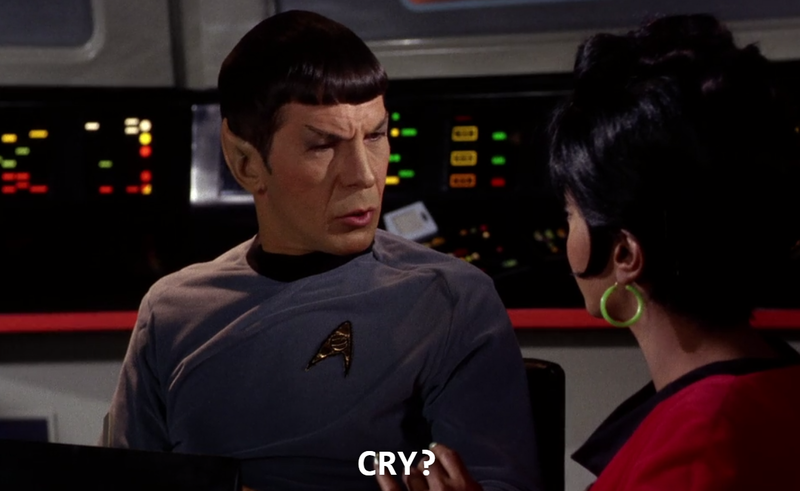 Uhura: "Mr. Spock, sometimes I think if I hear that word frequency once more, I'll cry." Seriously, look at this face. He's completely befuddled by this concept of "cry." Oh my gosh, can't take him anywhere. Also Uhura is so stylish with that hair and earrings. I want to be just like her when I grow up. Smart, Stylish, Sassy. With the ability to annoy pointy-eared, green-blooded hobgoblin aliens. Uhura: "Tell me how your planet, Vulcan, looks on a lazy evening when the moon is full." 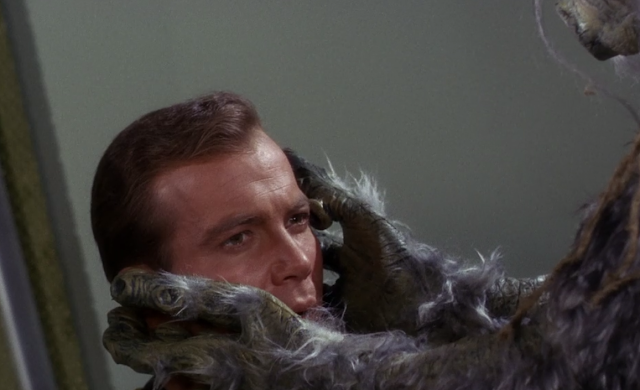 Spock: "Vulcan has no moon, Ms. 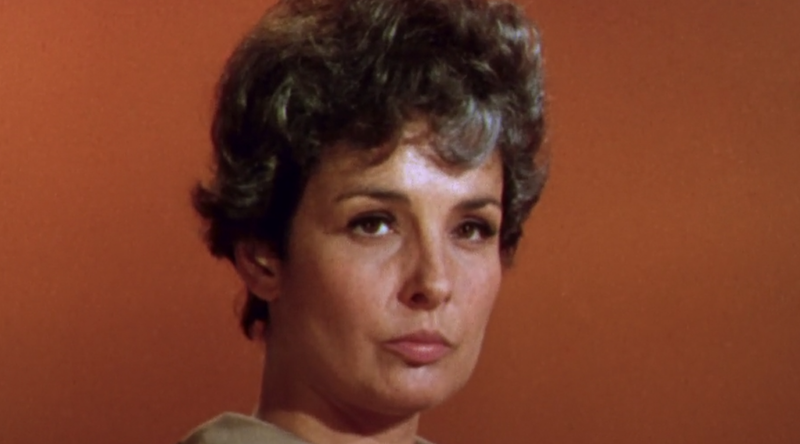 Uhura." 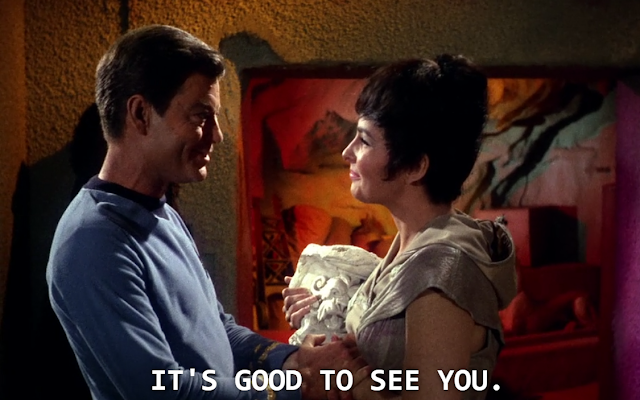 Spock is soooo awkward during this entire conversation. I LOVE IT. 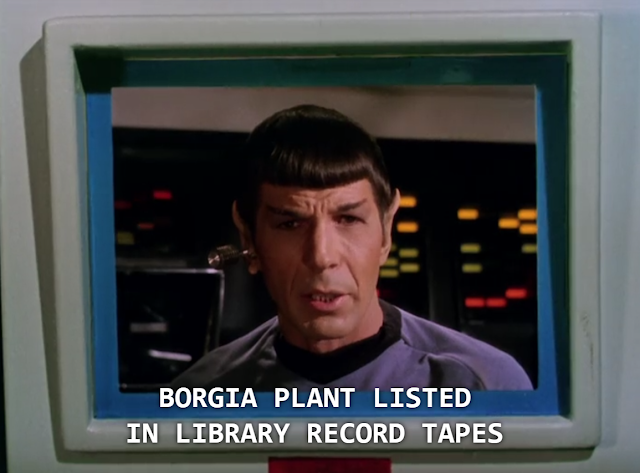 Borgia plant killed Darnell, only it didn't. sounds like someone is a liar, liar pants of fire. And now McCoy is angry. Why is he always angry? And now Kirk is angry at McCoy for being angry. I just love all the sounds the ship makes too. The beeps and tweets and swooshing suctioning doors. I used to have a Star Trek sound effect CD that had all of the bridge beeps and other sounds from the TV show in like 30-second tracks. It was great and so fun to listen to. These TV show creators were so creative back then. 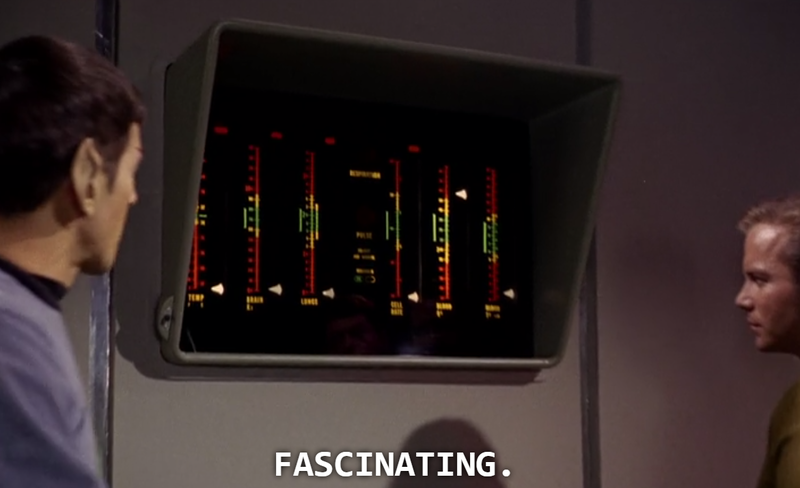 Spock looks at a board with a bunch of unlabeled colored lines with white arrows pointing on them and all he has to say is "Fascinating." You, sir, are fascinating. No sodium chloride in his body. THAT'S SALT. THERE'S NO SALT IN HIS BODY. do-do do-do... The Twilight Zone. Oh wait. Wrong show. Contrary to popular belief, Kirk is intelligent and actually pays attention. Nothing can get past him, right? Definitely not the salt tablets. He's not just a captain because he can give orders and look good sitting in the Chair or ripping off his shirt during a fight. Mr. Crotchety is still angry. Kirk: *sassily waves hand in the air* "Yeah, yeah, whatever major loser." Doesn't put up with Mr. Crotchety's crap. 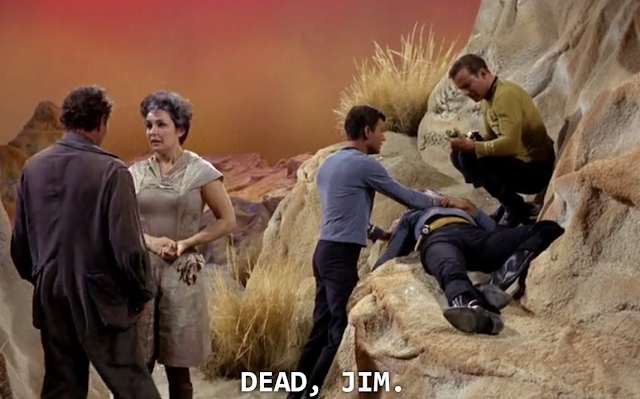 Kirk sacrifices two more crewmen to the slaughter. Ironically enough neither are wearing red shirts. Mr. Crotchety: "If there was anything here, we'd know about it, wouldn't we?" Me: Oh, yes, you would. You sniveling crotchety man. You do know something. I'm watching you. Kirk says he doesn't like mysteries, but that is literally the plot of every episode of this show. You're in the wrong line of work here, pal. No one wins a stare down against Captain James Tiberius Kirk. Noooo one. Mr. Crotchety finds dead crewman #2 and searches for Nancy, who is suspiciously bent over dead crewman #3. Crotchety literally tries to draw her out with salt tablets. 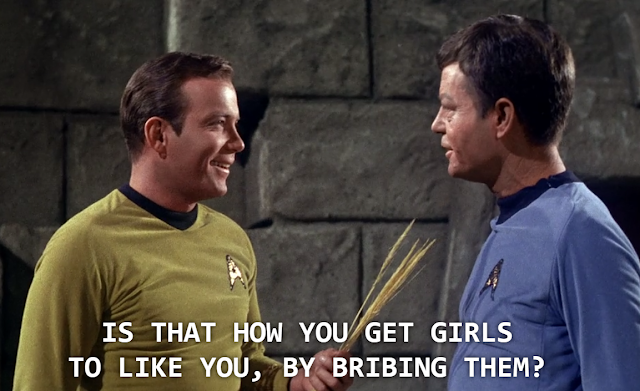 Maybe Kirk was right about bribing ladies. It's nice to see that the dead crewmen do have names, even if their only purpose is to die. RIP Darnell, Surgeon, and Green. Other than the fact that she's standing over Green's dead boy, she just looks like she's up to no good. look at that face! Grab the shakers, she's coming for all the salt. Kirk gets mad. McCoy gets madder. They decide to return to the ship... with GREEN-WHO-ISN'T-GREEN. DUH-DUH-DUN! 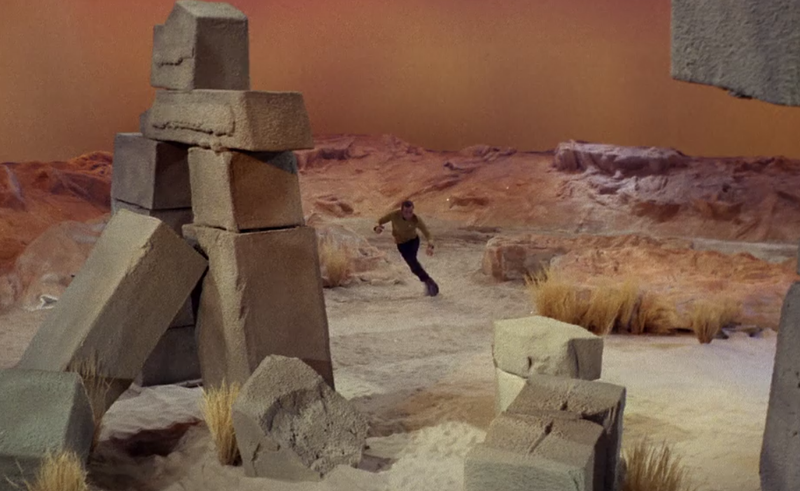 Seriously, these special effects are fantastic for 1966. Why is there a female crew member just standing around in the hall with a tray of food? Oh, her name is Janice. And she's someone's personal yeoman. What is a yeoman? Nancy-Green-Whoever... you're not going to pass for a Starfleet crew member if you just follow Janice around like a creepy puppy. Janice: "Why don't you go chase an asteroid?" Perfect. Remind me to use this next time I need to shoo someone away. Look at these guys drooling over Janice. HAHAHA. What is wrong with all the men in the future? "Man Trap" makes sense. SULU. He looks so happy. She's talking to his plants. His plant's name is Beauregard. How perfect is that? Sulu's quarters probably consist of plants and fencing swords. Who couldn't love this man? 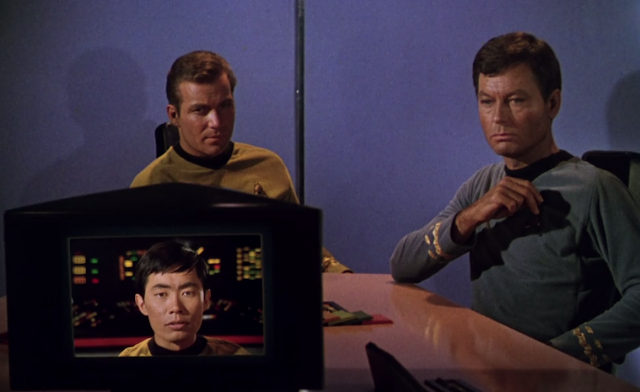 Then Green arrives being all weird, and Sulu's just like "What the heck, man? Why are you in my room?" and then the freaking flower starts screeching. Like you know there's something wrong when a freaking flower starts screaming and trying to hide from you. Sulu stroking the plant to calm it down is bae. Janice: "Is he going space happy?" SPACE HAPPY. I'd love to know what it means to go space happy. No matter how many times "Nancy" or whoever this is changes faces, he/she/it still acts super creepy. 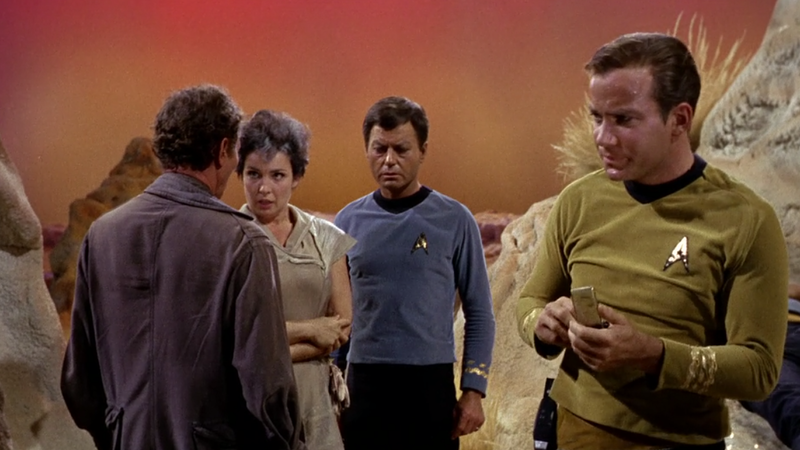 The entire exchange with Uhura is just awkward. She just stands there, paralyzed. How many times do Sulu and Janice end up saving people just by being in the vicinity? 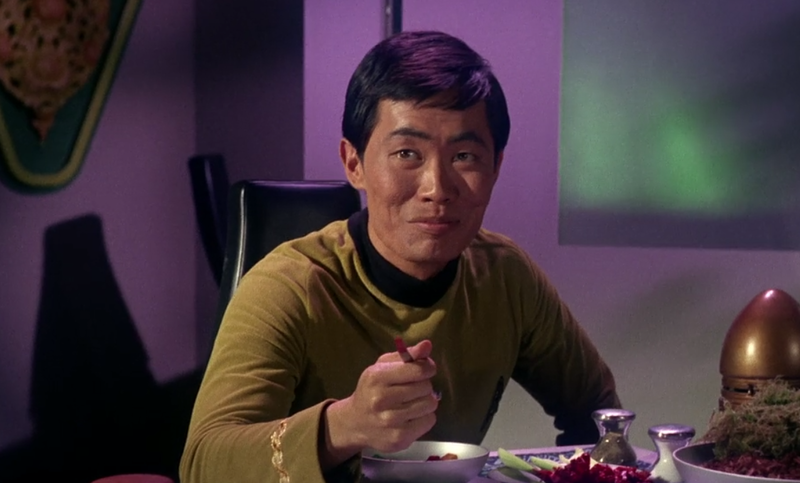 Can I just say that I love that Kirk is eating snacks while on the bridge? Do all girls who wear red and aren't Uhura stand around to hold food trays for other people? 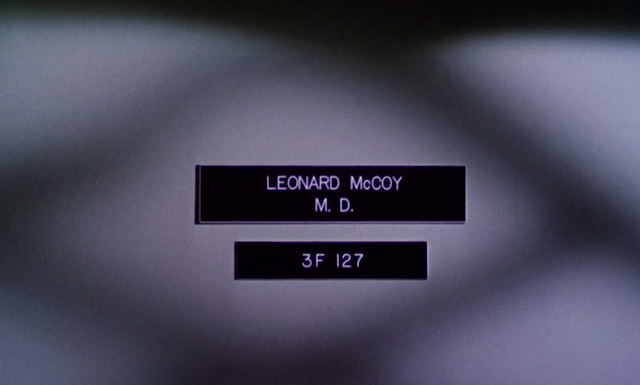 In case you couldn't read the "Dr. McCoy" nameplate on the door, let's do a dramatic zoom! The most amazing thing about Nancy's ability is that not only can she change her face, but she changes her clothes and entire body too. Like wow, what is your body made of that you can replicate clothes down to the details. Amazing. 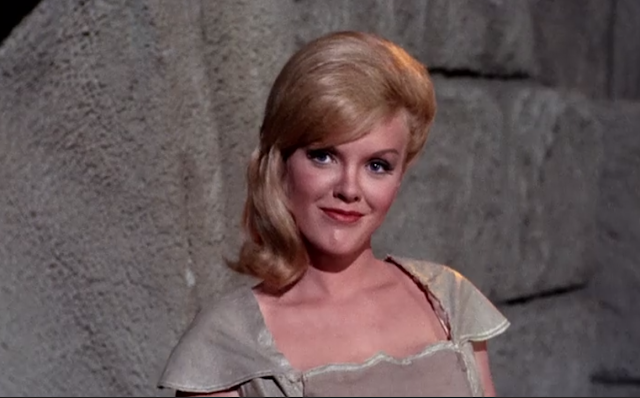 And McCoy falls right into her trap. "I wonder why Jim didn't tell me he found you." Oh, boy. She's playing right into his masculinity. "I like your feelings better. Much Stronger." RED ALERT. ABORT. ABORT. Get outta there, Bones! Another dead body! That makes four! He's still not wearing red, and he doesn't have a name this time. But he is wearing an awesome space suit! Janice: *gasp* "Look at his face!" Okay but his eye definitely twitched. Nancy-who-is-definitely-not-Nancy: "Just sleep. Nancy will take care of everything. Like sucking all the salt from your body. mwhahahaah!!!" Ah, changing into McCoy. Didn't see that coming at all. Ever. Never. Ever. Nope. Professor Crotchety is still a crotchety old man: "Go away. We don't want you here." Finally, an intelligent person like Mr. Spock finds Green's body and figures out that MAYBE the killer can shapeshift and is currently on board the Enterprise wrecking havoc! Send in the cavalry. Red Alert. GQ. Yes because announcing over the entire ship's speakers that there is an intruder alert will not in any way alert the intruder that you know that he/she/is on board. Good thinking. I love watching random crew members run around the ship corridors. It's like the perfect opportunity to be an extra in a TV show. 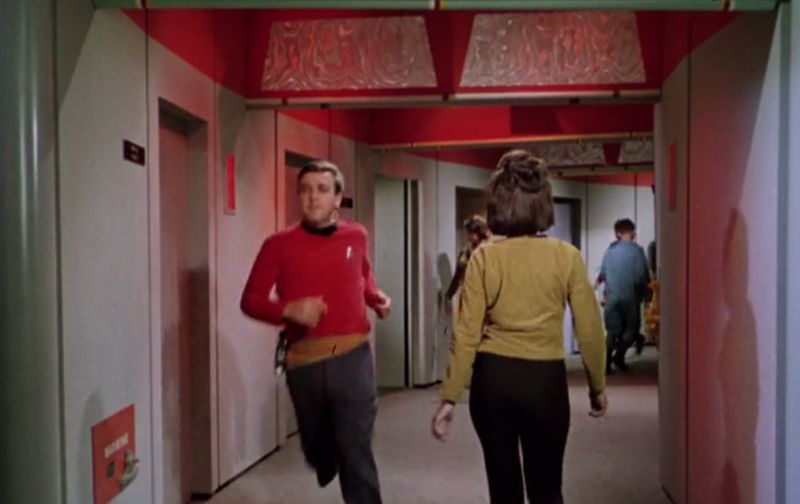 You get to wear those awesome uniforms and be in front of the camera in your best moments of dashing across the hallway. More special effects are special. Look at these two studmuffin buffoons working together. (They are studmuffins. I've heard older ladies talk about them before. It's great fun.) They don't even need to speak to make a plan to catch Mr. Crotchety. That's real friendship. Deep, real deep. 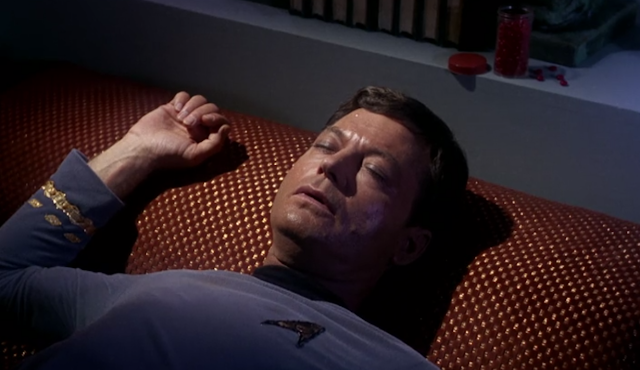 Just in case we forgot the real McCoy was actually asleep in his room, there's a quick shot of DeForest Kelley fake sleeping in agony before we switch back to Nancy/Creature disguised as McCoy going to the bridge. They just let anybody on the bridge, don't they? 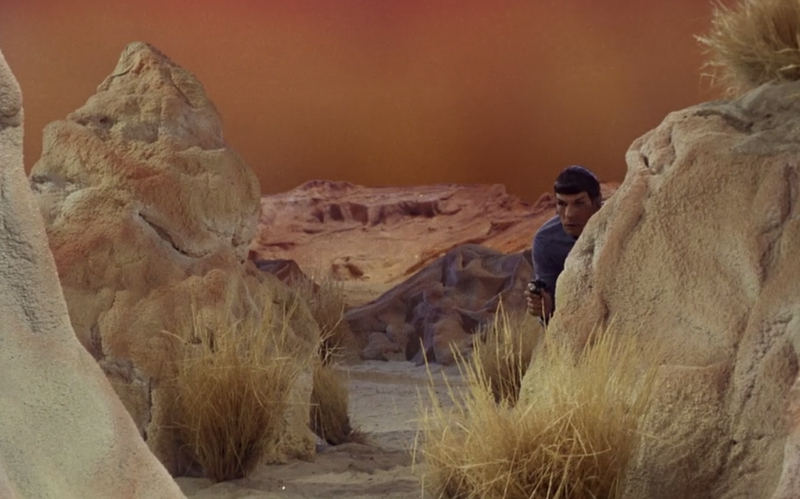 Kirk and Spock running around the desert vista together is also what I live for. Mr. Crotchety has no idea what is coming. The lack of background music/sounds makes this scene even more hilarious. 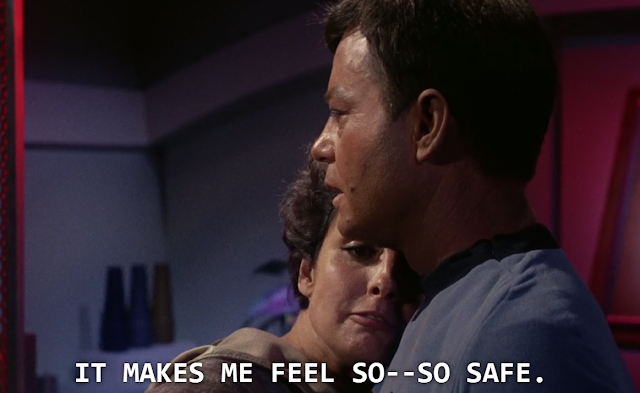 We all know William Shatner is the king of overdramatic acting, but watching it is completely different. It's actually amazing to see how dedicated he is. Zigzag run around the set: Aye, Aye Cap'n. Snake crawl through a sandpit: Aye, aye, Cap'n. Duck and cover around Styrofoam rocks; Aye, Aye, Cap'n. He really deserves a couple of gold stripes for his dedication. "The last of her kind." Oh really? Kirk and Spock are not impressed at all by Mr. Crotchety's speech about Nancy (or whoever) being the last of her kind. Okay, but look at these impressive special effects here. More stare downs with dramatic music! Huzzah! tRUTH SERUM. What is this Divergent? 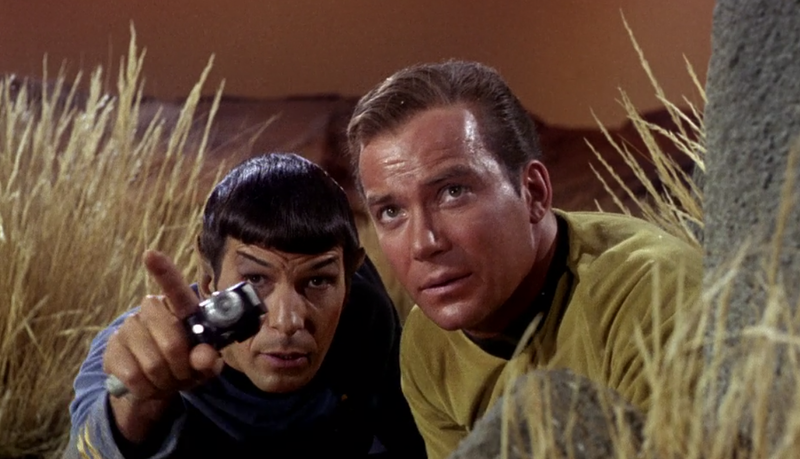 Of course Spock had doubts about McCoy. He probably stashes a diary on the ship where he has all his doubts and suspicions about everyone and how to prove that his theories are true. or not. The creature turned on Mr. Crotchety! Farewell, sir. I guess people will leave your planet alone now. 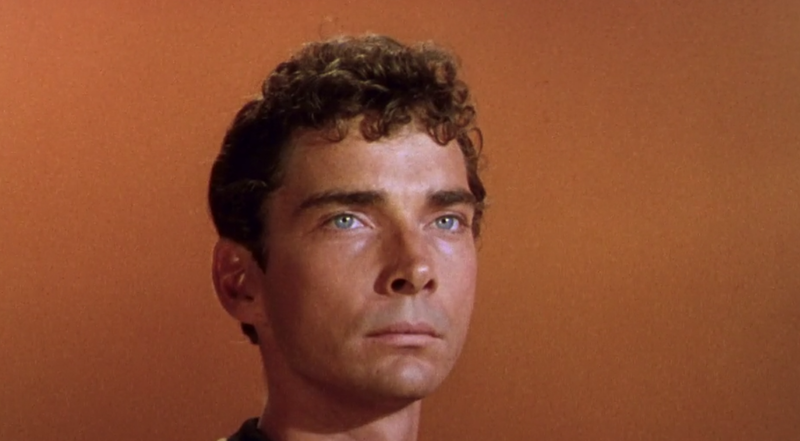 Spock: "My ancestors spawned in another sea." Nancy--or the creature--is a conniving lil thing, ain't she? Well, so is Kirk, I guess. I mean, it's honestly hilarious that the episode titled "The Man Trap" is the only episode probably in existence where Kirk isn't seduced by or seducing the pretty lady while almost everybody else (including McCoy!!!) is falling for her instead. Amazing. If a woman comes at your with her hands raised like claws, you should probably assume something is definitely wrong. 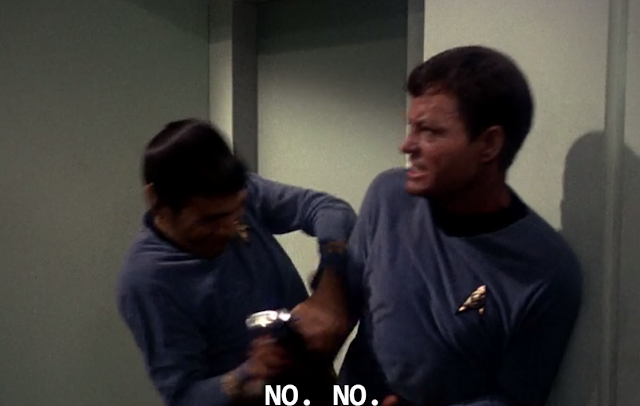 Spock and Bones' relationship: a summary. Poor Spock. 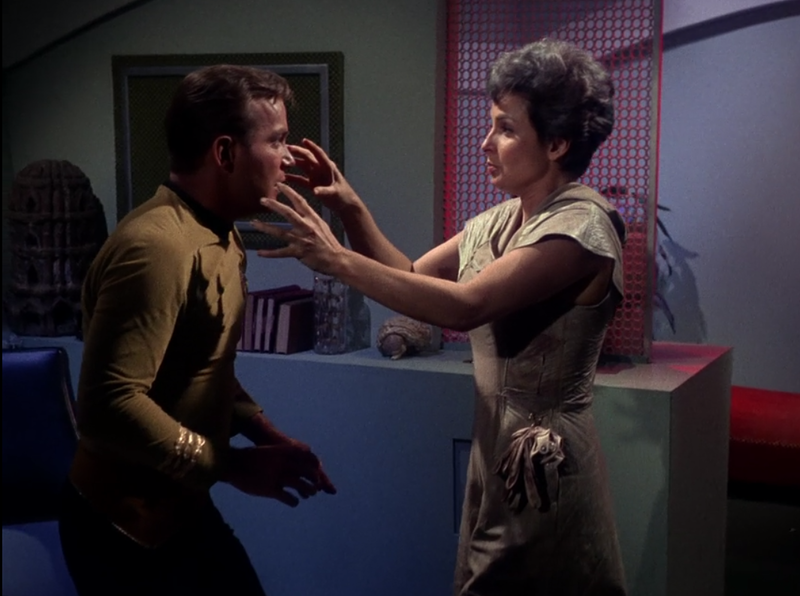 He's gotten beat up twice now, nobody believes him when he's suspicious of others, and Uhura spent a good chunk of her screen time terrorizing him with feelings and illogical things. Poor Spock baby. Yikes! No wonder it's the last of its kind. Here let me just stroke your flawlessly chiseled face with my suction-cup fingers. The creature does look a little sad at the end there. I'd be sad too if I looked like that and had to eat salt all the time. It must be awfully draining to switch appearances so often just to try to please other people into handing over their salt. And it would be sad not to have a name. I mean, its name is the "M-113 creature." The species doesn't even get a name. Even though some people call it a salt vampire, but now that just sounds sad. Just like Frankenstein's creature. Poor M-113creature. When I drive my car I like to pretend this is what my windshield really looks like. The famous end credits music! Huzzah. Mission accomplished. It's amazing that this is the first episode. It starts off without an introduction or a sufficient plot line to get you involved and wanting to watch more. They barely give you anything about the characters, who is who and why they are significant. 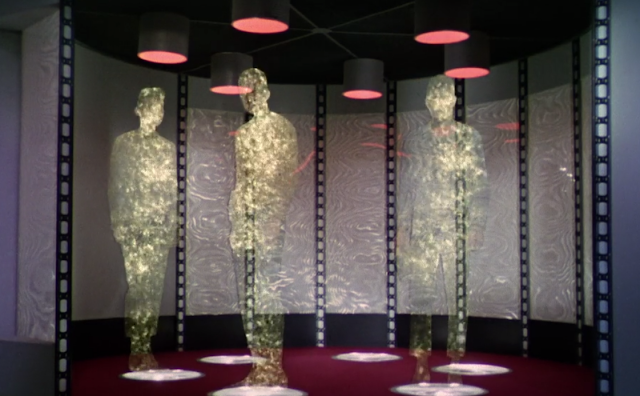 There's nothing about what kind of ship the Enterprise is or what they are doing this deep into space in the first place until the opening credits. There's no background, no history, no explanation. They just throw you right in and hope it intrigues you enough to get you back next time. 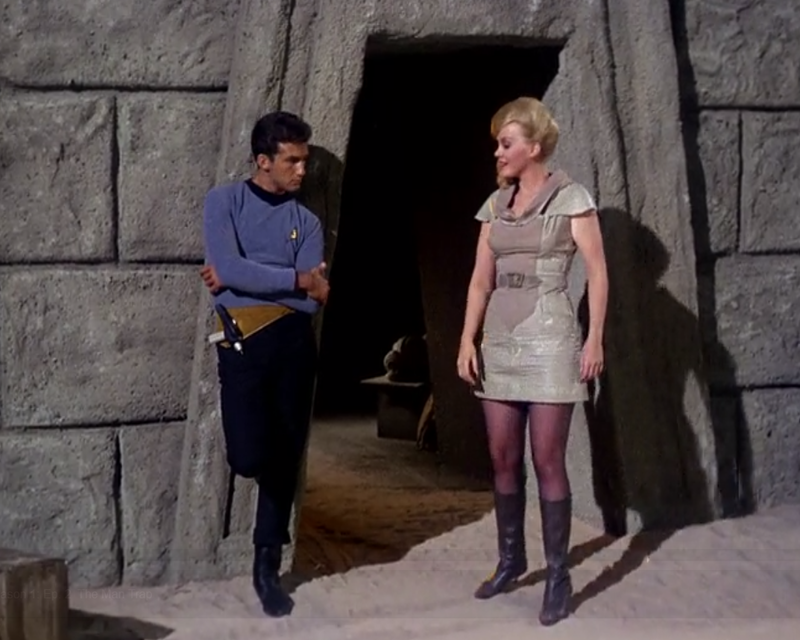 However, for the time, their set designs and costumes and special effects are crazy cool. I mean, this was one of the first of its kind. Planet of the Apes wasn't out yet, neither was 2001: A Space Odyssey. There were other science-fiction movies and such (Doctor Who and the Twilight Zone were out but are different and in black and white), but Star Trek was in its own galaxy of production. Amazing really. It took the creators two pilots to convince NBC to air it, and now look at it. There are 726 total episodes of Star Trek TV shows, thirteen movies, and plenty of books, comics, video games, and more. Don't even get me started on the pop culture references. 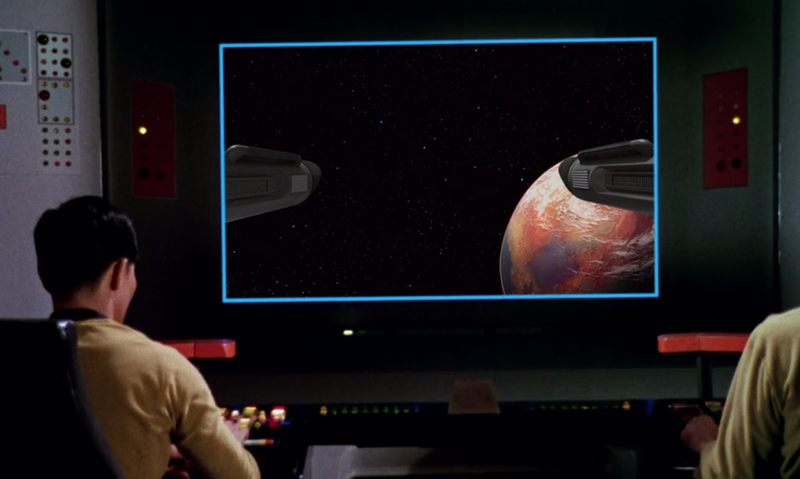 This show has boldly gone where no other franchise has gone before! 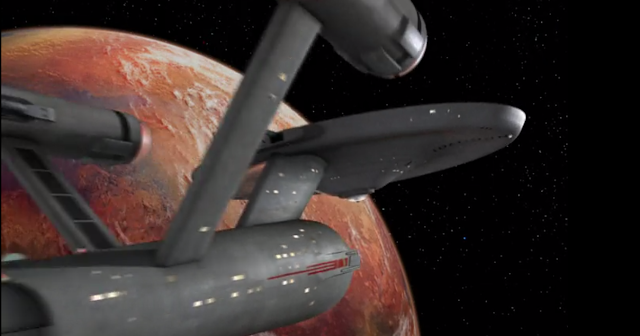 Have you seen the first episode of Star Trek to be broadcast? What did you think? All images are screenshots from the actual episode via Netflix. Live Long and Prosper!